Choose Your Party Bike Tour! Enjoy the best party bike Nashville has! Get exclusive! Reserve a private Nashville party bike. 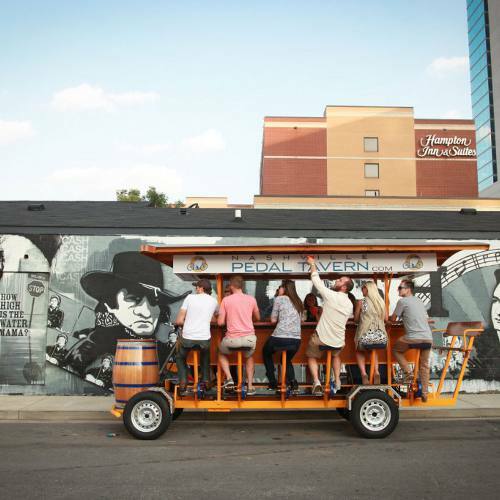 Nashville Pedal Tavern requires a minimum of 8 riders and our bicycles can accommodate a maximum of 15 passengers. Great for any occasion or celebration! All riders must be 21 or older. $100 Deposit Required. Looking to try the #1 party bike in Nashville? If you have a group of less than 8, the public tour is the tour for you. What better way to meet new people than on a pub crawl? Hop on a public tour to make new friends and really get a taste of Music City. Looking for the best way to raise employee morale, or just want to see the sights of Nashville with your company? Hop on a Nashville party bike corporate tour! We offer corporate tours of the Midtown and Broadway bar scene Monday – Thursday! Looking for unique and fun things to do in Nashville? Enjoy the greenest pub crawl in Nashville! Voted the #1 Outdoor Activity in Nashville, our party bikes can accommodate up to 15 people and we welcome groups from two to over 150. Celebrate weddings, anniversaries, birthdays, holidays, company outings, team building, vacation adventures and bachelor or bachelorette parties with our Nashville tours. Our two-hour Nashville bar crawl includes exclusive drink specials for you to take advantage of from our partners. Experience one of the best things to do in Nashville! Nashville Pedal Tavern is a unique and affordable way to experience our beautiful city, from Broadway and beyond. Ride on Nashville’s best party bike along the downtown Broadway area and visit the bars that the country legends made their home. Enjoy live music and drink specials all day every day with this fun-filled Nashville bar crawl! This Nashville bar crawl takes you where all the locals call home. This area is great for dive bars and great food. Ride along Music Row where your favorite artists work their magic to create your favorite hits! Looking for unique and fun things to check out in Nashville? 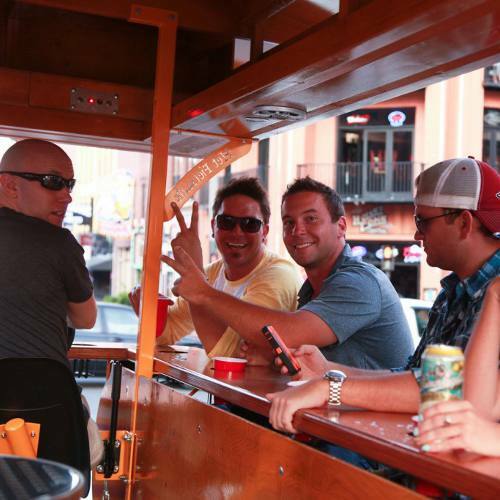 "The Nashville Pedal Tavern is hands down one of the best experiences that you can have in town. We gathered up 32 of our closest friends and rented both bikes on a Saturday morning to pre-game for a charity event later that day down on Broadway. Our entire group raved about the entire experience! Angie & Brian took fabulous care of us by keeping the party going and ensuring that everyone is safe and happy. The Nashville Pedal Tavern is a must do experience in music city! Trust me, I've done it 5 times now in less than 2 years." "I have booked the pedal tavern for the 4th time and have never had a bad time ever. This past weekend at the CMA's we booked it again for my Daughters 21rst Birthday Celebration with 5 of us there celebrating together. We had an awesome group with us also celebrating a Birthday. Our pedal director/Bartender "NICK" was the absolute BOMB and made our experience even more a BLAST!! From the time of signing in with the also NICK and until the time we exited the Pedal Tavern was the Best time ever! THANK YOU!!!"